Nestle Coffee Mate is a coffee creamer on the market that offers more than 20 flavors of creamer to suit the taste of every coffee drinker. 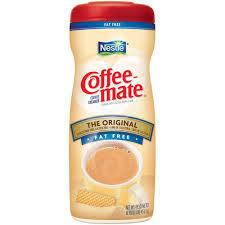 Coffee Mate was first introduced to the market in 1961 and has since then, acquired different flavors to fit the trends, making it among the top coffee creamers marketed in the world. Coffee Mate is most notably popular because of its high number of flavors, with over 25 in the United States. Some of the top flavors in grocery stores in America include French Vanilla, Peppermint Mocha, Gingerbread and the Parisian Almond Crème. Another unique feature of Coffee Mate that puts it a notch higher in terms of competition, is the fact that the powder form can last for as many as two years and still remain fresh. There won’t be any need for refrigerating it, and once open, it remains up to two weeks fresh! Coffee Mate is a perfect option for family and office use as it is sure to remain fresh. Coffee Mate continues to bring new flavors to the shelves. There has been a world café collection launch, which focused on bringing new native European flavors and marketing them in other world markets. Coffee Mate also has put into consideration the increasing diabetes risks and for this reason, there are sugar free and low fat creamers on the shelves. You can opt for either a powdered or liquid form of your favorite Coffee Mate flavor and be assured of the same satisfaction. For that perfectly fulfilling cup of coffee, look no further than Coffee Mate: the best coffee creamer brand on the market.